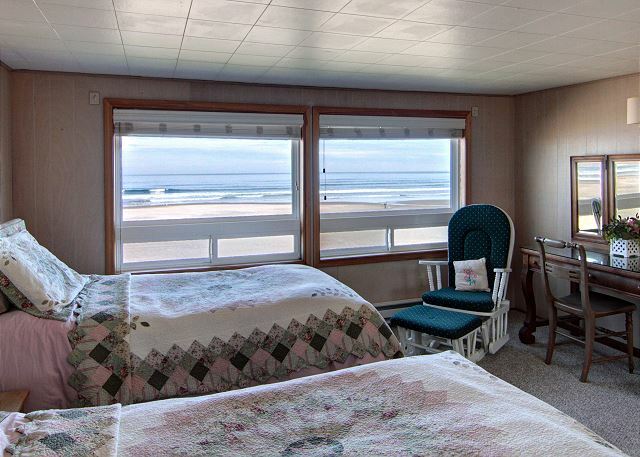 Aldoren's Wind 'n Tide is a delightful oceanfront property at the Tolovana end of Cannon Beach only steps away from the sand. 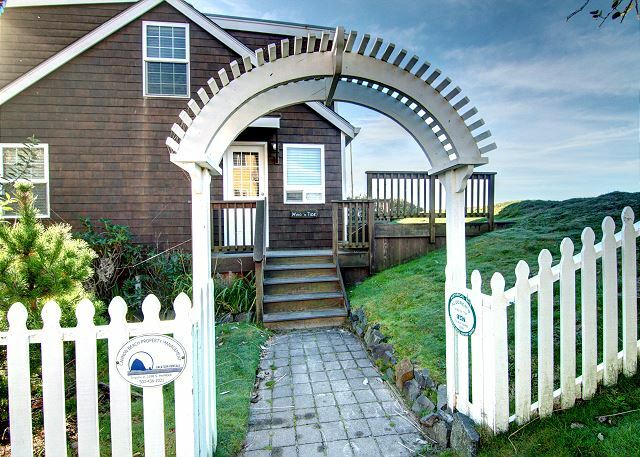 This two-story bungalow features a large deck perfect for capturing views of Haystack Rock, evening sunsets, and a long stretch of beach-y seascape, ideal for a small group or family, or a romantic getaway. While the bungalow's 1940's homey atmosphere sets a cozy mood, the remodeled and updated kitchen and bathrooms provide the best of contemporary comforts. It's original Vermont furniture and snug gas fireplace invites tucked away relaxed moments lulled by ocean waves in the background. Set off from the living room is the master bedroom with a Queen bed. 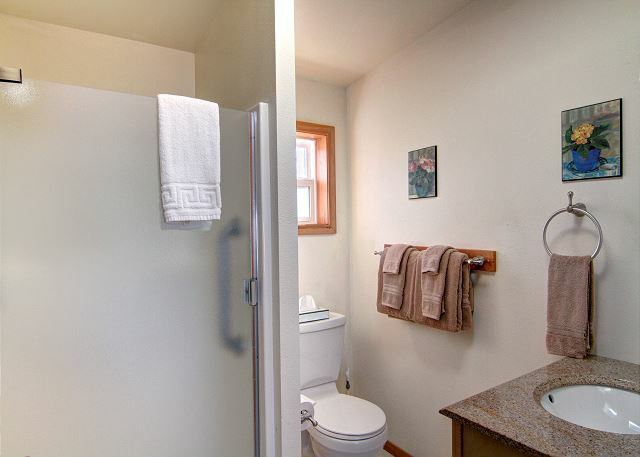 To the right of the adjoining hallway is a full bathroom with a shower and tub, and a separate vanity. Enjoy the ocean view and a cup of coffee at the kitchen / dining table while breakfasting or playing a board game. This well-equipped, bright kitchen with plenty of counter space is just the right environment for creating memorable beach meals. Just off the back of the kitchen is the mudroom with a stacked washer and dryer, and the backdoor leading to the shrubbery-enclosed back yard and patio area. Between the living room and kitchen, the stairwell leads upstairs to the additional sleeping areas. 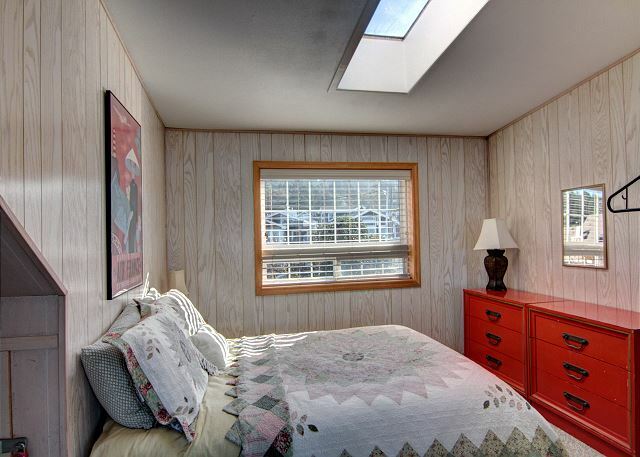 The west-facing dormer area has two Twin beds and the best ocean view in the house, while the opposite dormer features a snug sleeping area with a Full sized bed. The full bathroom on this level has a walk-in shower. This charming bungalow awaits you, and is only a short walk to a noted bakery, and convenient dual grocery market / historic post office and pizza parlor! "Great weather / great house on beach"
"Great location and very cozy"
"It was right on the beach and the upstairs layout was awesome. The kids loved it. I loved the views!" "Winter season is a good time to visit. " "Great location and view. Grateful for a bedroom on first floor. Would have been nice if chairs for deck were more readily available but deck is very nice. Got to relax in the sun a few times. " "We thoroughly enjoyed this house. Cozy and convenient. " 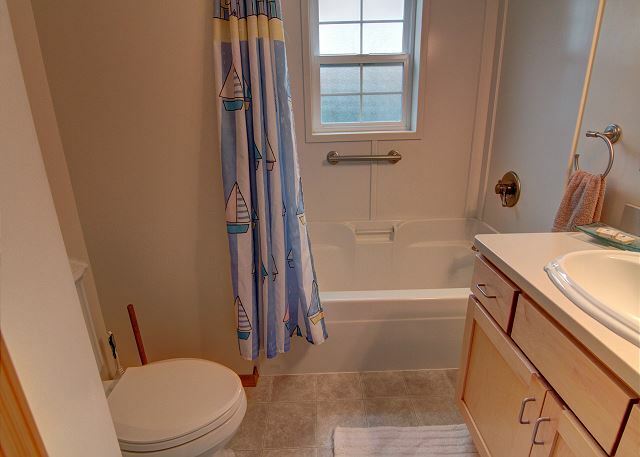 "Very clean, so nice to have new updated bathrooms and kitchen in a beach home. Our family of 4 was very comfortable, the beds were decent, the upstairs dormer has a wonderful view of the beach, sunsets, delightful to sit in the rocker with coffee or wine and just gaze out at the beauty. We spent most of our time on the deck which is basically right on the beach. Easy beach access is right next to the house, this is a better beach location away from the more crowded areas of Cannon Beach.We were concerned about being right next to a hotel but not an issue in any way. There is public parking right next to you and the public beach access, but again not an issue. The only concern I had was with the washer/dryer, made very loud sounds and may need to be replaced soon. I very much appreciate CBPM for their help and honesty in finding a home. I am very sensitive to old musty odors and they gave me honest feedback regarding the homes I was considering." "My friends and I have stayed in this quaint little house on the beach at least 10 times over the years. It always feels like "coming home"! It is a perfect mixture of old and new. It's very clean and nicely maintained. The deck, on a nice day, is second to none! Enjoy...just enjoy! :)"
"It has been 3 years since we stayed at the Wind 'n Tide but the place was just as wonderful as we remembered. The location is just perfect - right on the beach. We were there this time with 3 adults and our two dogs. The house will sleep 6 but there isn't really room for more than 3-4 people at the table in the kitchen. The kitchen is extremely well equipped. We will definitely be booking it again. " 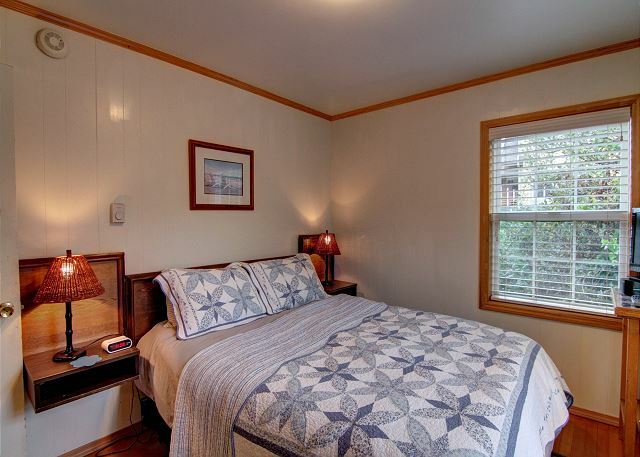 "Wonderful location, homey quilts, fully stocked kitchenware, and clever upstairs bedroom with chimney divider that ensures maximum privacy. We'll definitely make this place an annual destination!" 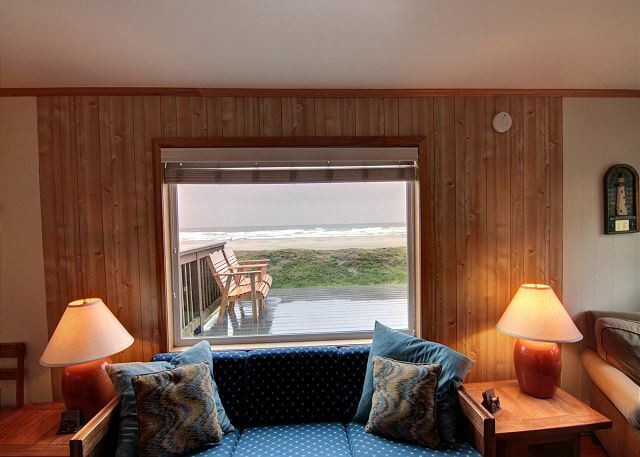 "our go to place at Cannon Beach"
"What a great stay we had. We use to rent this house out a few years back and loved it than. Now with up grades it is even better. Right on the beach with everything you need to make your vacation complete right down to a welcome basket for my dog. " "We enjoyed our stay very much.There are a few items that should be addressed. The light fixture above the kitchen table needs to be checked out. It was flickering on and off. Not enough washclothes available. Mirror in upstairs bathroom should be raised up some. Hairdryer in downstairs bathroom didn't work.The recycle container for glass items was missing. The location is wonderful and the kitchen was the best we've had - well stocked with needed items. " "This was the perfect getaway. The location is perfect. We were right on the beach with a great view of Haystack Rock. The home was very comfortable with everything we needed. We will be back!" "We really enjoyed Wind 'n Tide. The location is outstanding - the deck great, even in winter. We had 4 adults and 2 kids and fit perfectly in the house. The dining table was tight, but that was not a problem at all." "We have been coming summers, and it was great to be there in the quiet season. Not so crowded at a great rate. Beach house was beautiful." 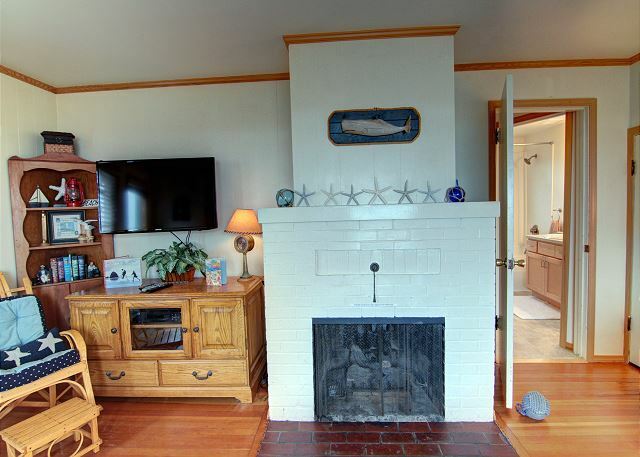 "This charming cottage has been our traditional rental for decades! " "Simple lovely. Quiet, calm, right-on-the beach access. Everything you could ask for in a vacation rental. Loved the deck and the views." "We loved everything about our stay here. Being able to just walk from the door to the beach was wonderful. The house is well maintained with everything you need for your stay. Getting to sit on the back porch with some wine and watch the sunset was the best part. Hope to return again one day. " "Had a wonderful time in this adorable cottage by the sea. Fully equipped with everything we needed to be completely self sufficient - all we had to do was bring our own groceries. The days were spent walking the beach with the dogs, people watching, reading in front of the fire and napping! The view from the deck was gorgeous and we had the best evenings sitting out there, sipping wine and watching the sunsets. Definitely would return." "We loved the location and the deck. The landscaping was really nice. We would rent again. " "Loved the bunnies, loved the house...perfect for a getaway. The inside of the house is just perfect. My only criteria would be to have some better furniture for the outside. Those chairs are brutal to get out of, also maybe a cocktail table out there for drinks. With the exception of the outside furniture, this house is a win!" "This property has a location that is perfect. " 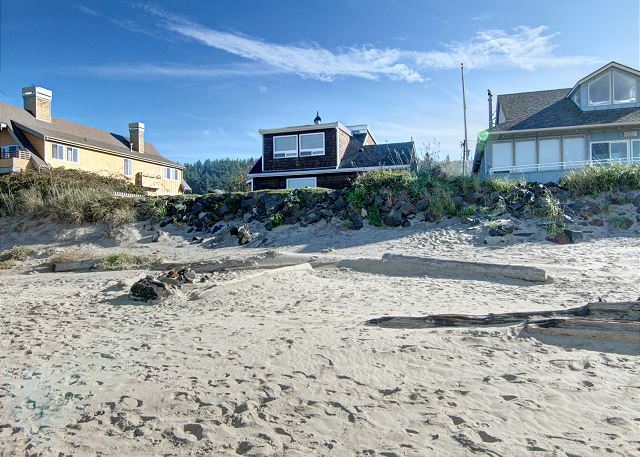 "This house is the perfect spot to take in the beauty of this beach! We enjoyed every minute of our 8 night stay here. We will definitely be coming back!" "Wind 'N Tide was a terrific property with plenty of space for the four of us plus our dog. We enjoyed mornings in the livingroom with the fireplace on, drinking a cup of coffee and evenings watching the sunsets on the porch with a glass of wine. Our days were full of walks on the beach, watching our chocolat lab swim in the ocean for the first time and exploring the Cannon Beach area including Ecola Park and watching puffins on Haystack Rock. Our best meal was cooked at the house - linguine and clam sauce. It was also great to be able to walk to a coffee shop, convenience store, and Mo's restaurant. Not much driving required once we got there. " "Great location, wonderful house. " "Our family had a wonderful time! Staying right on the edge of the sand with the Pacific rolling in and out was exactly what we needed. The three-year old never dropped his sand shovel, and the nine year old conquered the dual control fighting kite. Wind 'n Tide fit our needs perfectly. The upstairs was a quiet separation from the hubbub below and the baby napped. The kitchen was outfitted well for families. The little dining table was a bit tight but we were never sitting down for long anyway! We received warm service from management from reservation to checkout. One suggestion would be to add a deck umbrella-we were lucky enough to have 7 days of SUN, and more deck seating. It would be helpful to have a reserved parking spot. The busy public access next door made returning with an SUV a challenge. Small things considering all the rest. Thank you!" "Cozy, well appointed house in a great location. Large deck overlooking the beach. 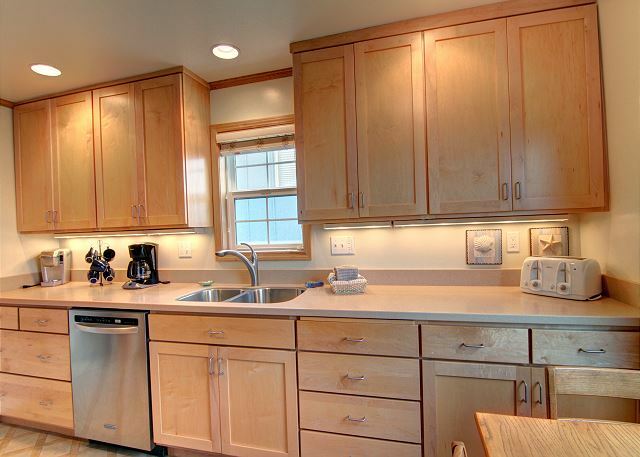 Well equipped kitchen with plenty amenities." "Had a great time, I thought it might be a little noisy so close to a small hotel and a public beach entrance but it was very quiet. Would stay there again!" "This isa wonderful house for a small family stay- especially if the weather is good! The deck has a wonderful view- with the needles and haystack on the North end of the vista- as does the upstairs bed room. The living room is quite small, but cosy. 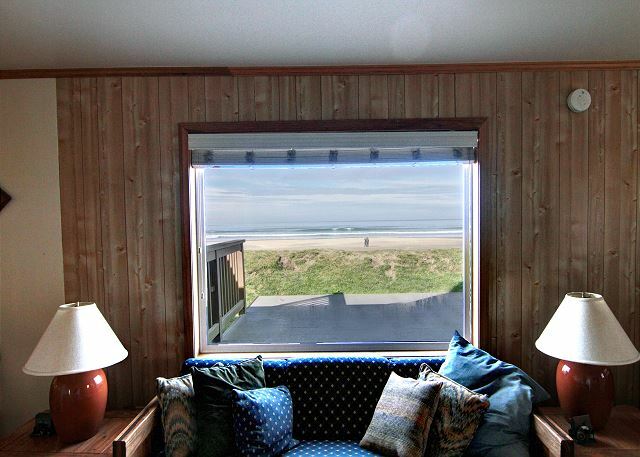 A sand/ grass berm in front of the cabin does block some of the beach view from the living room. We stayed here a few years ago with our dog- who loved the big back yard. The living room/ dining space is very small- so hope for mostly outdoor time! " "We were very happy with the home. It was right on the beach and had everything we needed." "This was our second stay in the Wind 'n Tide home. Once again, we were very comfortable and enjoyed our stay very much. We rested, walked, and we watched the storms and the brilliant sun from our perch upstairs. We did not want to leave!" 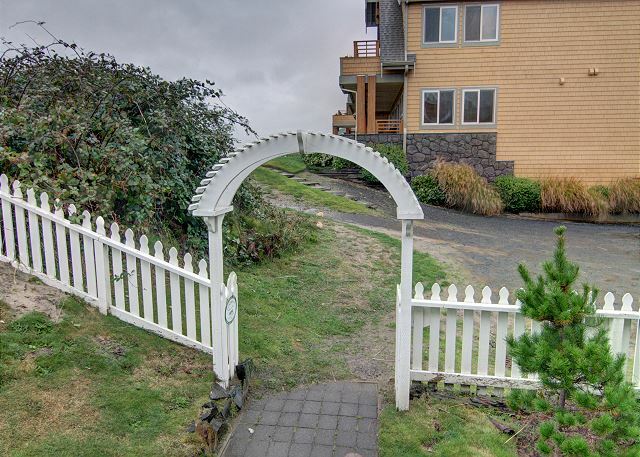 "This was our 3rd rental using Cannon Beach Property Management, and I must say they just keep getting better and better. From the booking process all the way through to departure (boo!) was awesome. Aldoren's Wind 'n Tide is perfectly located and beautifully remodeled. We will be back!" "What a magical vacation! The location was perfect for our family of 4- a nice walk to the big rock meant the area in front of the home was quieter and gave our 5 year old lots of space to run around and fly his kite. Place for breakfast - it gave views that couldn't be beat! We'll be back!! " 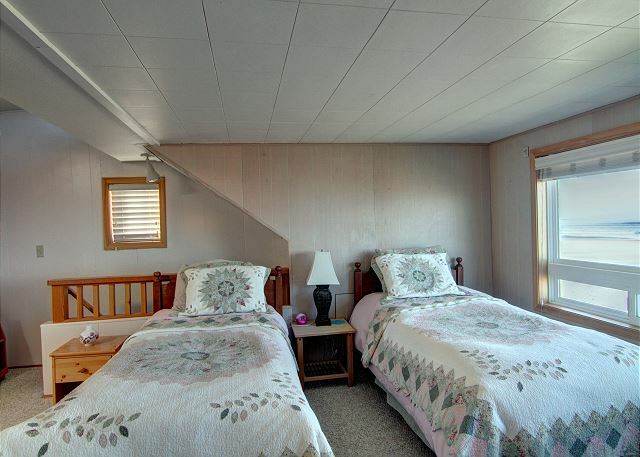 "Our family has stayed here many years and love the cozy house and its location. The upstairs beds are a double and two singles. Hopefully, we will be surprised by a queen replacing the double one of these years. Our tall ones would be far more comfortable. The management company generously allowed us the use of an additional rental property nearby for satellite TV when the receiver in this unit could not be repaired in time for our arrival. Very impressive customer service!" "Great location; very nice house"
"This is our second visit to Aldoren's Wind N Tide and we absolutely love it! The cottage is the perfect size for the two of us and in a perfect location for taking in all the sights and sounds of the beach. We are making this our annual getaway and are already looking forward to next years stay." "This cozy home right on the ocean is our family's favorite getaway spot. The recently remodeled kitchen is a pleasure to make breakfast in, and you can take your tea (or coffee) out on the deck and soak in the soft sunrises over the foggy beach. You can open the windows to let in the ocean breeze or close the house up tight and turn on the heat: whatever you like for "cozy". It's a three block walk to the wonderful bakery/coffee-house "Sea Level" or to the SurfCrest market. We love this place and come a couple times every year!" "A very lovely well cared for cozy spot to let the world go by. Loved the location ! The days were warm, nights cool. The fireplace was an added bonus. We cooked fresh seafood, sipped wine, read books & walked the beautiful beach. Yes, we will return. " It is a marvlously licated property! the hedge blocking the kitchen "
"This is a wonderful location with a very nice little house right on the beach. Great deck to watch the sun set and the activity on the beach. " "We loved our brief stay at the Wind 'n Tide. Being a stone's throw from the beach was a real treat. We're so grateful that this place is dog-friendly - it was so convenient to have the back entry so we all could towel off before heading back in. The house is beautifully decorated and maintained. We enjoyed beautiful summer weather, but I think this would also be a great place to go in the winter - you could watch the storms on the water and enjoy a warm fire too! You won't want to leave!" 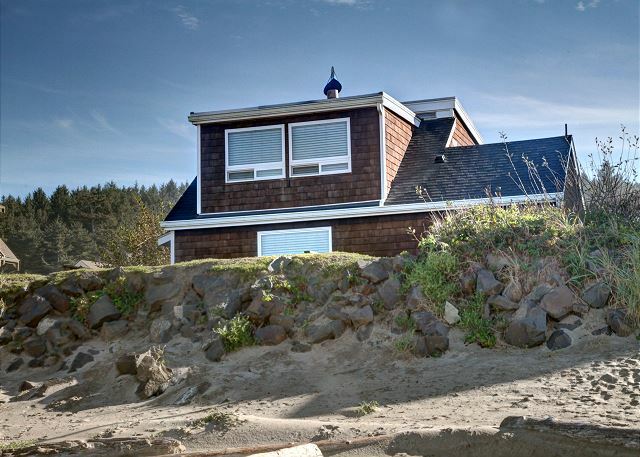 "The house is warm and cozy and an ideal location for accessing and viewing the beach. Will be back next year!" "A great stay & we will return." 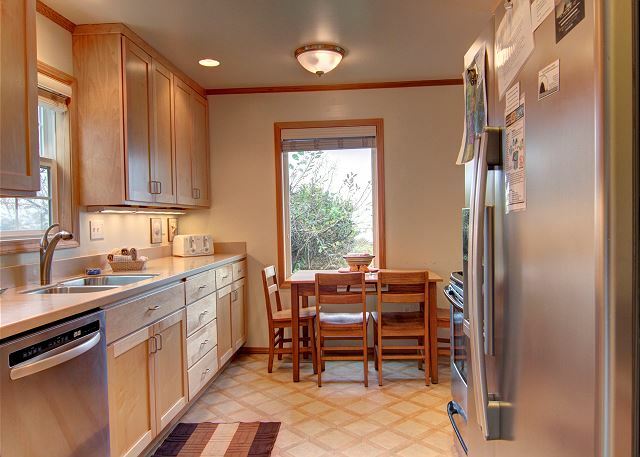 "Wonderful location on South end of Cannon Beach- great for beach walkers. Not in center of town, so you get times with the beach to yourself.This is a smaller house, and cramped shared space for larger families when weather is bad- and but wonderful front deck and back yard for doggies or kids. Downside for us was the wifi- could use some more power- kept dropping signal near kitchen or on deck. Upstairs double bed needs replacing, but others were comfy. Kitchen well stocked for cooking in, but tight fit at table." "A great weekend getaway from Seattle. Everything about it was just magical." "I cannot say enough about the experience my daughters and I had here. It was a much needed respite, and the experience satisfied our needs in every way. From our first encounter with property management staff who made things smooth, easy and cheerful, to the moment we stepped into our delightful little home away from home my girls and I were in heaven. 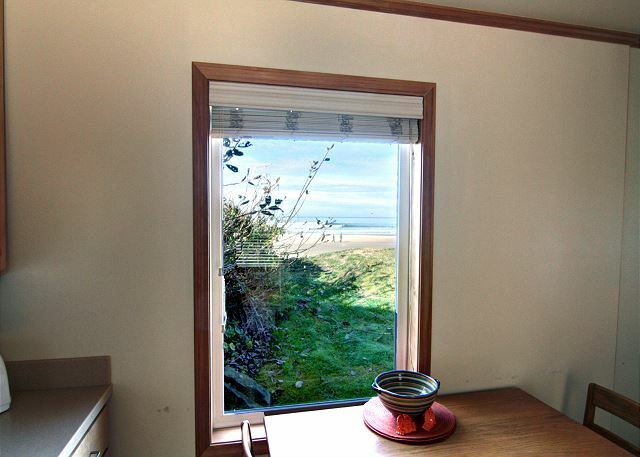 We thoroughly enjoyed the spectacular views of surf and Haystack rock right out our window, the thrilling sound of crashing waves, the ample kitchen, the wonderfully comfortable beds. We found the place clean, charming, comfortable, in great condition, in spectacular location! The property management team armed us with helpful and interesting materials about the area, and made checking in and out a piece of cake! They seemed genuinely to appreciate and celebrate our need for time away and that somewhat intangible thing meant a lot to me. My teenage and 'tween' daughters announced they wanted to move in permanently! They especially loved the location and the comfortable, spacious upstairs suite. We all heartily recommend this place! And we want to come back as well!" "We were excited to stay on the beach for a change and couldn't believe our luck when we drove up to this wonderful, historic, cozy house! The house is comfortable and lovingly cared for--it was immaculately clean. The kitchen is brand new and there's a nice little gas fireplace (as well as heaters in each room) to keep you toasty if the weather's rough. You may want to stay upstairs--what a great view! It was perfect for us. The house is an easy stay if your dog is coming along--there's a yard, a hose, and you are literally steps away from the beach. We hope to return!!" "The Aldoren's Wind & Tide was the perfect get away for my boyfriend and I last weekend. When we first drove up to the house we both got very excited. The location was amazing as we didn't realize that we would be so close to the beach. When we walked inside it just felt like home. A cozy cottage with a new kitchen, a fireplace, comfortable beds and amazing front deck perfect for watching the sunsets, made our time very memorable. We will definitely be returning to the Aldoren's next year!" 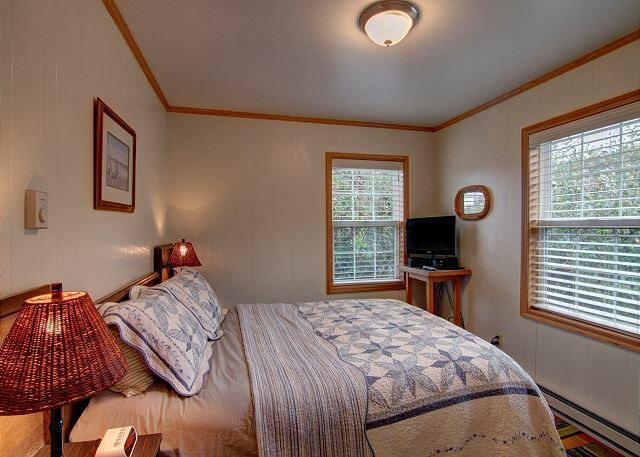 "Very nice cabin and so nice that we could bring our dog and be right on the ocean. Big kitchen with all the needed utensils. Very clean and comfortable. " "This is our third stay at Aldoren. We love the proximity to the beach. Hearing the surf in the back ground is so soothing. We lucked out weather wise. Sunny days with light breezes. Although It is great even in stormy conditions. We feel you really cannot lose when staying here. We will return next spring. Thanks." "Our family of 5 enjoyed our stay at Aldoren's Wind n Tide -- even with the crazy storm that came through. We could go right to the beach with the dogs or just watch the storm outside. The kitchen was very well equipped and we cooked in for several breakfasts and dinner. The back yard space for the dogs was a plus. This was our second stay at this property and we would definitely reserve it again." 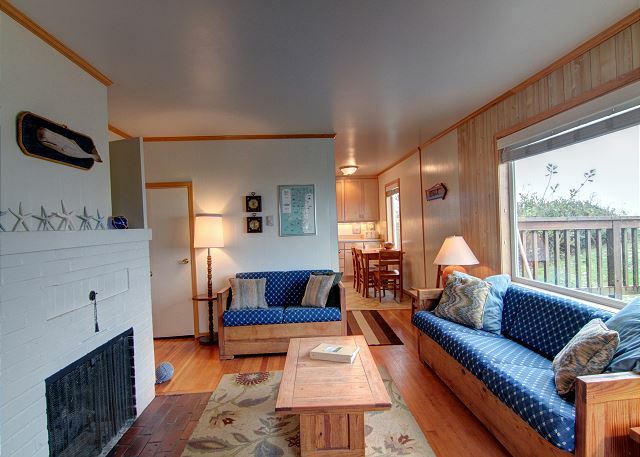 "Best holiday rental in Cannon Beach"
"I would recommend Wind n Tide with reservations. The place is great (location and amenities), however the living room furniture could be improved." "The location can't be beat. It is so cute and the sunset from the deck is perfect. House is very clean and well-maintained. Would definitely rent this again!" "We love it and we are going back again and again....reasonable price and I felt grat being on the beach. 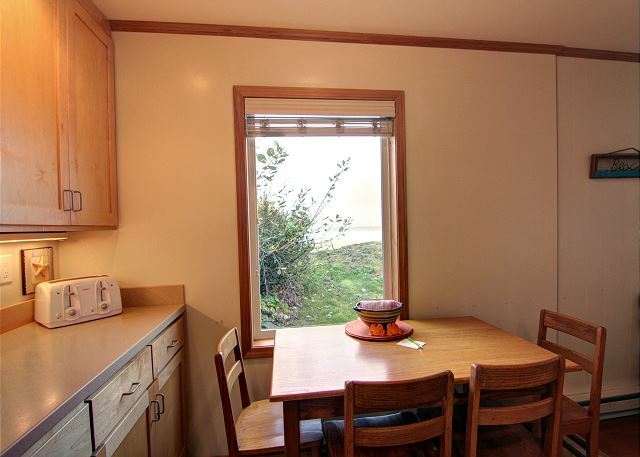 Loved it"
"Cannon beach property staff are very helpful and prompt in getting back to you "
"Beautiful view and quaint home. Furniture could be more comfortable, but otherwise, really nice." "This is a wonderfully charming property just steps from the beach. The view is amazing! The kitchens and baths look like they have been recently updated. The house was very clean. The only reason I didn't give an overall rating and the property's general condition 5 stars is that the couches are terribly uncomfortable. This has been mentioned in some other reviews, but I didn't really know how bad it would be until I experienced it myself. They are basically wooden benches with wooden sides with some not-so-supportive padding. Luckily the weather was nice while we were there and we were able to spend a lot of time outdoors, but if it had been raining and we were spending a lot of time indoors, I think we would have been very unhappy. To make the couches more comfortable we resorted to taking extra blankets from the beds and putting them under the cushions. For me to come back, I think I would need to see that new couches had been purchased. I marked that I would recommend this property to a friend, but I would first warn them about the couches. " "This was our first stay at a rental house and we were really happy. The kitchen was well stocked and the bath towels and linnens were nice. The house is small for six, and there is only kitchen seating for a four, so that made famiy dinners difficult. The location is the best, though, and there was room for everyone to hang out upstairs. The furniture in the living room could use an update but it looks as though the owners are doing some upgrades. It doesn't do the house justice to see old, out of style furniture when you first walk in. 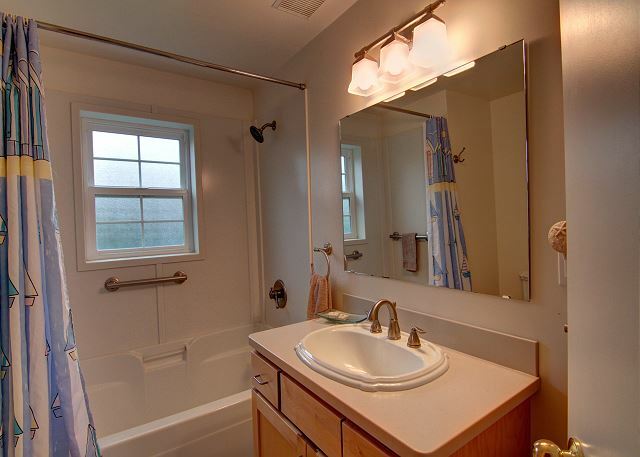 The faucets and lighting are new, so maybe it's in mid-upgrade.I'd definitely recommend this house to a family of less than 6, but with 6, it was possible and somewhat cozy. "My wife and I had an enjoyable time and, for the two of us, the place was perfect. We appreciated the quality of towels used for showers and the bed in the 1st floor bedroom was comfortable. We didn't think to bring a hair dryer, but managed. The fireplace was great! We also appreciated the professionalism of your staff and for the few days we were there the weather was great! A bonus!" "The cottage was the perfect size for my partner and me; however, the layout was not exactly what we were expecting. The 2nd floor has the best views but also essentially 2 bedrooms without a wall. Thankfully, we did not need the extra bed, but I would not recommend this cottage if you are expecting 3 separate and private bedrooms. It is essentially 2 bedrooms. The upstairs bedroom views are fantastic, however!" "We enjoyed the view and being on the beach is the best way to fully appreciate the ocean." "This was our second visit to this home. We love it! the location can not be any better. Perfect for little kids and adults. VERY clean. Only downside is the couches are VERY uncomfortable - if they upgraded the couches, this place would be PERFECT!" "We arrived after 7:00 pm due to a cancelled flight. I had to hold a flash light in my teeth in order to work the lock and actually be able to see it in the pitch black of the north porch. However, a light was left on in the house which was very nice. The home itself is very nicely done, the furnishings could be updated for a bit more comfort on those rainy days. The timer on the fireplace should be updated as the constant ticking is rather maddening. The glassware should be replaced as it has become so murky it appears dirty and is rather unappetizing. The home was very clean and I would say the housekeepers are excellent. 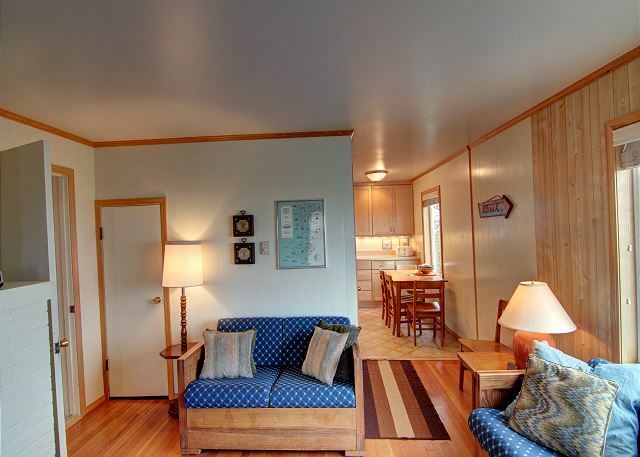 The home was very conveniently located for us and overall our stay was most pleasant." "Great place, wish we could have stayed longer!" "We have been going to Wind and Tide for about 40 years. It has such wonderful memories for us and still has its charm. We are onto the third generation and it is still such a special place for new memories. " "Clean, comfortable and great location. Easy beach access and a great deck if you don't want to go onto the sand." "The images on website are alittle misleading, however, we thoroughly enjoyed our stay. 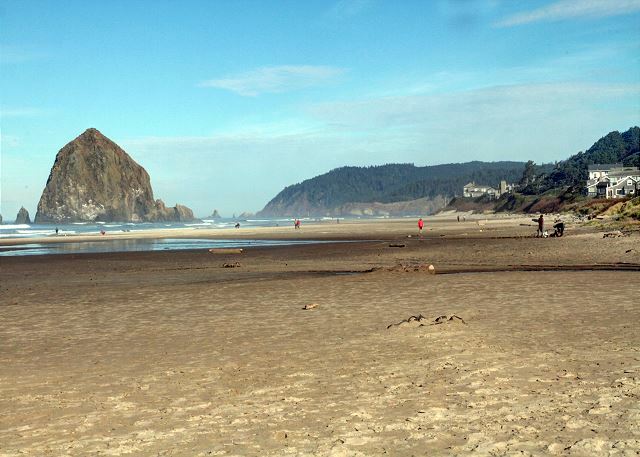 Cannon Beach is one of our favorite places to stay." "We stayed at Wind n Tide. Great experience all around. We have three adopted children whom do not transition well. Stayed at Oceanlodge the year before and kept wondering about "that little house" to the south. Got home and made reservation. Perfect fit for us and the kids. Was happy to show it to some other folks who were staying at Oceanlodge. Great value." "We stayed there August 3-10, 2012 and had a great time. The cabin was fantastic - the upstairs really makes the place, our kids loved having their own little loft with a view. We brought our King Charles Spaniel who ran and swam all week. Perfect family vacation house. " "We had a wonderful and very relaxing time at this beautiful hidden treasure on the beach. Our family thoroughly enjoyed being right at the beach so that our grandchildren could really appreciate the beautiful sand, ocean and sunsets and our dog enjoyed chasing the birds and rabbits. This rental property was in perfect condition and we all were very confortable. Thank you." "My sister and myself stayed at this property with our husbands and 2 children each and enjoyed staying right on the beach! You have great access to the beach. The only downside is that there is not 3 bedrooms, only 2, separated by a small pillar in the middle of the room. It worked pretty good for our family but felt that the "3 bedroom" is incorrect." "Loved it, would certainly rent again." "What a wonderful time we had. The house was just perfect for us and our family. Even though it rained and was quite chilly, we had an absolutely amazing time, as always, at Cannon Beach. The home invited us in and let us stay ever so comfortably; the staff at CBPM was so friendly and accommodating. We hope to stay again next year." "Fabulous location, charming cottage, very well-equipped kitchen, a few blocks walk to a great bakery." "Cozy cottage in a wonderful location." "This house couldn't be better! We celebrated our 48th anniversary here and can't wait to come back. We just loved the whole experience! "We enjoyed our stay. The property is very nicely cared for. A great location." 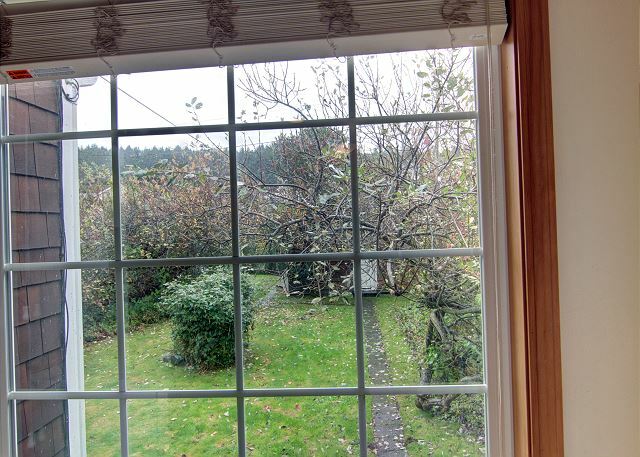 "This is a wonderful house -- very cozy and comfortable, great views, amazing location! Our kids played in the sand while we kicked back on the deck. Great walks on the beach in either direction. Thanks for welcoming our dog, too -- he had a great time! We've stayed here three times already and will be back again, I'm sure." "We all were delighted to stay here. Kitchen is excellent for eating in (which we prefer). Well stocked with utensils etc. The view is spectacular. from up and down, bathrooms super clean, beds comfy. 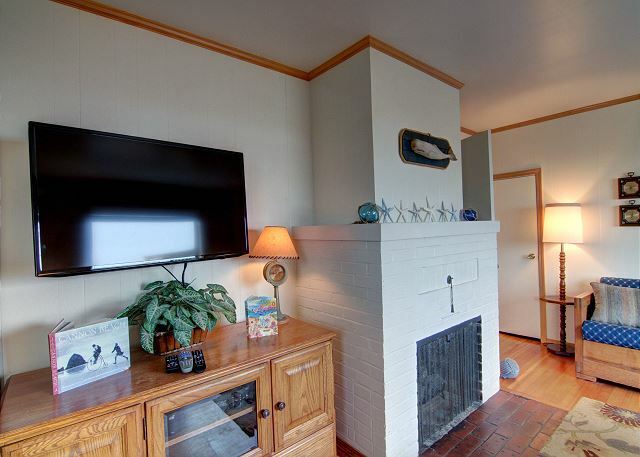 TV in every room.Fireplace for that extra warmth. Would love to visit in warmer weather to bbq on the deck. Thanks great 50th treat." "We loved the house so much that we already booked another weekend at this house. Great location/views, layout, etc." "We had a great time staying at this Ocean Front Location. 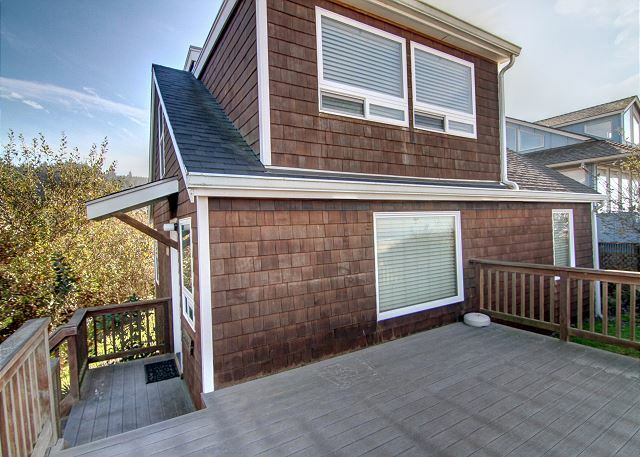 Right on the beach, great deck and updated house. Small but perfect for a family of 4." "The home is beautifully located. The upstairs is the gem of the house, bright and sunny with beautiful views. 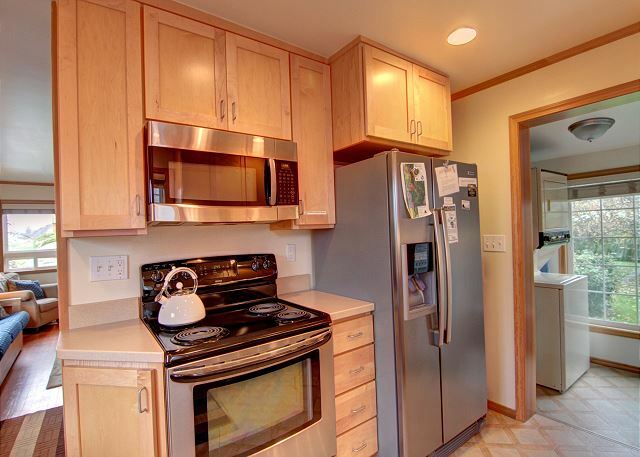 The kitchen is spacious and newly updated with a great assortment of cooking and eating accessories. Other than a trip to Mo's for chowder, we cooked in the entire time. Bring a couple of your own non stick skillets and your good to go. I brought some extra spices too but Aldoren's has more than just salt and pepper which was a nice surprise. The house was very clean. We were very happy with this house and would come back again. The only negative was the on-line reservation system is difficult to use and not accurate. Much easier to call the property management company directly." 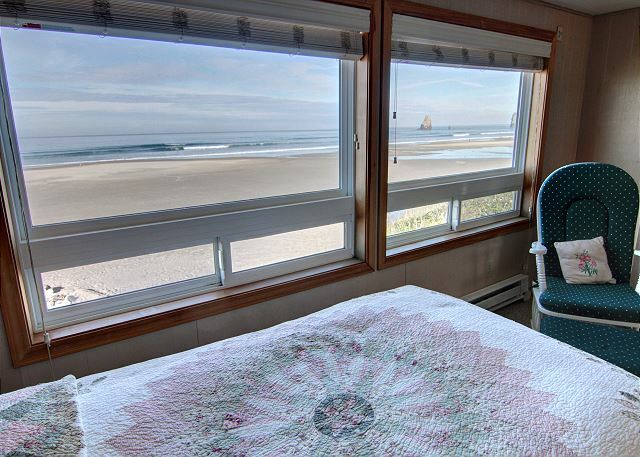 "Great location - walk out the front door, across the deck and you're on the sand. The updates to the house are nice - love that there's no carpet in the living room anymore and the bushes near the kitchen window is trimmed so you have a great view as you sit at the table. Love the new fridge with the filtered water - saved me the purchase of bottled water and ice !! Love the Direct TV with pause feature (like home). Would like to see a new couch/loveseat - the old existing couch/loveseat is not comfortable. Would also like to see at least one chair on the deck for those days (athough rare, but I was there for a few this Nov!) when it's warm enough to sit outside and listen to and watch the waves (one of those heavy wood chairs that doesn't blow away?). The back yard is not fenced for dogs, but there's a back door leading to a pretty private back yard which is great for short, supervised potty breaks. " "This property is in excellent condition with the upgrades to the kitchen are excellant, there are a few items you might want if you plan on cooking-like a non-stick fry pan and bigger bowls, the furniture in the front room is very uncomfortable-an upgrade on that would be nice as this is the only gathering place on a rainy night with the family." "Our family have been renting Aldoren's Wind & Tide for over 30 years. 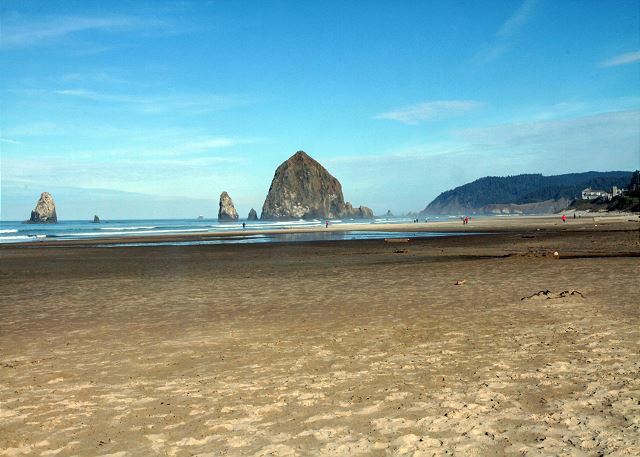 We have always had great memories of our reunions there and love the town of Cannon Beach. I don't care about the weather because I love what ever nature brings to this beautiful beach. There's so much to see and do by simply walking out the door, the beach is literally on your door step. Running, walking, Haystock Rock, flying a kite, bike riding or exploring some of the near by beaches, caves, dunes, towns, there's endless adventure. Our just relaxing by the fire with a book." - I could not locate the instructions for the fireplace so I did not use it. The staff at Cannon Beach were great and the check in process was simple which is what I liked. "Loved the home, the location and all the extras. Our dog loved the place too. We love Cannon Beach...and the views were spectacular. It was nice to have an upstairs room - so when we had to put the kids down to sleep, it was perfect because we didn't have to be too quiet." "Our family had SUCH a great time at this house. Unfortunatly the kids were not feeling well but because of the location we were all able to enjoy our vacation on the beach! " from the front deck. The upstairs loft style sleeping area with three beds was great for our young kids as everyone was got to be in the same room." "This was a great home for our family. 2 children, ourselves, and one set of inlaws. My 5 yr old daughter fell in love with the room upstairs. She could sit up there and color at the desk and look out the window. Very quaint." "We loved the house and its location. It was perfect for 2 couples (even with 1 dog and 1 child)! We are already talking about returning next summer. Thanks for providing the perfect get-away!"